I saw a few photos of the Love Locks in Paris around the Blogosphere recently and I couldn’t remember if I had any photos from my recent trip. Turns out I did. These locks are on the Pont de l’Archeveche bridge near Notre Dame. This entry was posted in Travel Photos and tagged Bridges, Europe, France, Life, Love Locks, Paris, Photography, Pont de l'Archeveche, Tourists, Travel, Travel Blog, Travel Journal, Travel Photo. Bookmark the permalink. Do they do it in Spain? I think so… I haven’t yet seen a bridge studded with these, but there are some, I’m sure. I’ve heard people mention it in conversation. Keep me informed if you find any. I’ve been noticing them all over Europe. I know a lot of people like these but I don’t. I think they are ugly. I also find a padlock a sinister symbol when it comes to loving relationships. I was horrified to see people were defacing the Millennium Bridge, which is a beautiful structure, with padlocks. Fortunately, I think they are being removed. I haven’t seen them on Millennium, but not sure I was looking either. I see the touristy bit to these locks, but it is a shame that they damage historical sites. I love the idea of these locks. This is such a great photo. I didn’t think there were that many there! Thanks, George. I was surprised by the number as well. It’s not something I see every day. Wow! Thee are so many! Yes! I wonder if they have to remove some to make room for new ones. Wow, I wish I was there to touch it. Incredible. And if you desire, you can add one. They sell them all along the river. Wow that is cool! Thank you! In Italy the government wants to banned them. I must say they are obstructive, often ruining the view. I heard on the Charles Bridge in Prague they cut the locks off since they damage the bridge. So I see the reasoning for the Italian government. What is the purpose of the love locks anyway? I think to show a couple’s everlasting love. Not 100% positive though. Glad I don’t have to polish them. Great photo. This must be a craze sweeping across Europe. I wonder when it started. I think there’s one in Seville…not sure though! Love it! Yeah some don’t like the love and lock connection and I can see why. Nice photo and an interesting tradition, TBM. Not one you see everyday, but they are popping up more and more. Those are some BIG LOCKS!!! There were larger than I expected. Quite VULGAR those LARGE locks. I guess they REALLY want love locked in! Ha, I agree with you. It’s nice on one hand, but does mar the view and I hope it doesn’t damage the bridge. Not seen this before and not sure how I feel about them to be honest. Partly I think it’s kind of sweet of people but then I think is it really necessary to make these sort of gestures? I dunno – can’t blame government’s for not wanting them – I suppose it does spoil the look of the bridge but it also creates a new unique view. See, mixed feelings! I loved this when we visited, and actually left a lock myself. I don’t really see it as any kind of symbol, just thought it’d be fun to go back in a few years and see if it is still there. It may just be a tourist thing, but I thought that’d be a good thing for an area that thrives from tourism? I wonder how long the locks stay. Hopefully you’ll see yours again soon. I love Paris! Even in Belfast. Didn’t know that. And I was a little uneasy standing on this bridge. How does it stay put? Yup, even in Belfast 🙂 The authorities removed them in Dublin – guess they were becoming a problem. Spoze I have seen pictures where the weight of them is making lamp posts and things topple over so sort of understandable once it gets out of hand. 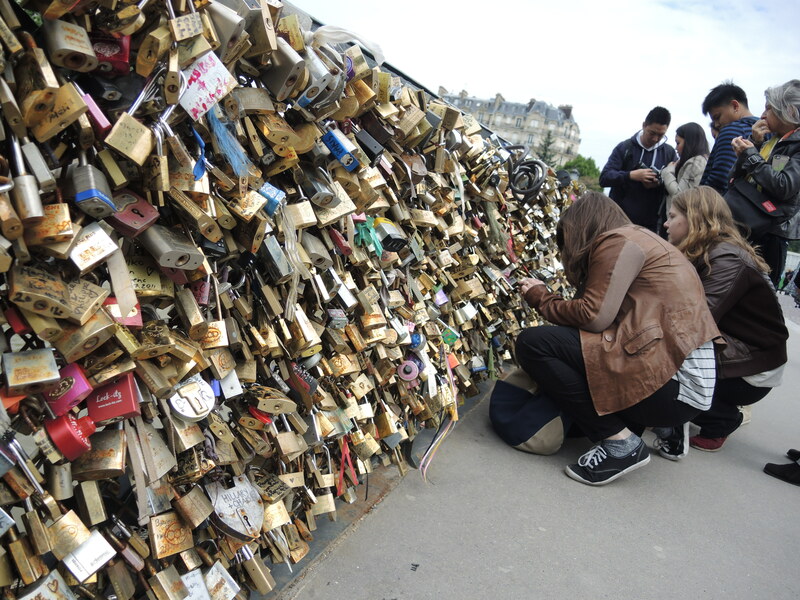 Although as a bridge I would prefer to be famous for love locks than people throwing themselves off me…. LOL, excellent point about bridges. I wouldn’t want to be known for the suicide rate either. Love is just a tad bit more romantic. Yes. Much more romantic than plunging to your death. I think it was the Charles Bridge – it was right around the corner from the John Lennon peace wall. We will definitely look for the bridge in Paris. 🙂 Thanks!! Have fun in Paris. It’s a great city! I’ve been noticing that as well.